There are several theories why, but a condition called Leaky Gut Syndrome is the most popular. Its emergence has created a huge market for new supplements and associated products. But just how big of a problem is it? 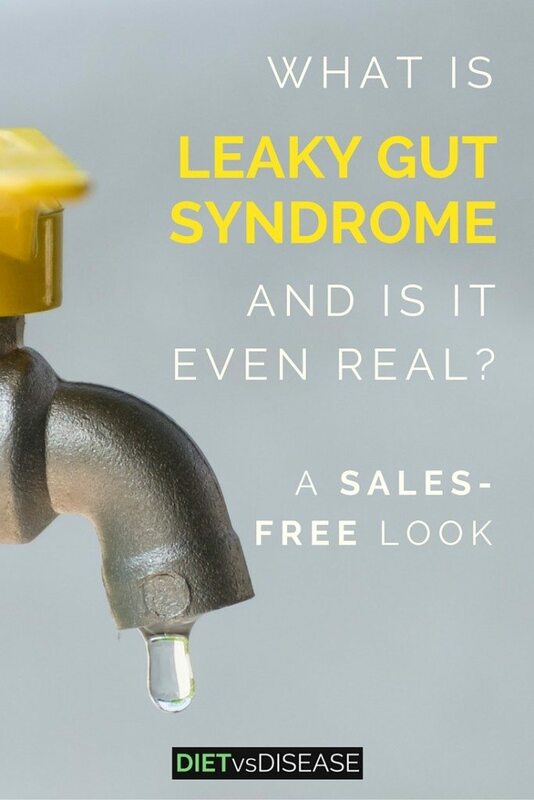 This article is a sales-free look at what we currently understand about leaky gut syndrome. 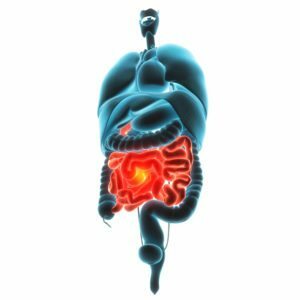 Leaky Gut or Intestinal Permeability? Is There A Leaky Gut Diet? Leaky gut (syndrome) is a condition characterized by damage to the lining of the gut (intestine). It’s said to be the cause of numerous digestive disorders and autoimmune diseases, such as Crohn’s disease and Hashimoto’s disease. At least, theoretically (1, 2). However, it has never actually been proven as the cause of any disease-state or illness. In fact, the name leaky gut is not a legitimate medical condition, but rather a marketing term. The generalized name allows it to be used as a “blanket condition,” one that can explain a range of health problems. Much like Adrenal Fatigue or Pyroluria. Since becoming mainstream, leaky gut supplements and other products have become widely available. Summary: Leaky gut syndrome is the name given to describe damage to the lining of your intestines. It’s not a legitimate medical term, and has never been shown to cause any disease. Although leaky gut syndrome is a marketing term, a “leaking gut” is a real thing in medicine. It’s best described as a loss in intestinal barrier function combined with increased intestinal permeability. Put simply, the lining of our intestine (gut) controls what materials may pass from the gut into the bloodstream. An increase in permeability means large unwanted particles can more easily “leak” into the bloodstream, hence the term “permeate” (3). Click to enlarge. Source: Nature.com/scientificamerican. However, most gastro experts believe intestinal permeability is a symptom rather than a cause of these conditions. Additionally, a certain degree of intestinal “leakiness” is natural in order to allow fluids and nutrients to pass through. An increased permeability could actually improve water and nutrient absorption as well as activating the immune system (1). For this reason researchers are not certain of what the implications are for increased permeability. 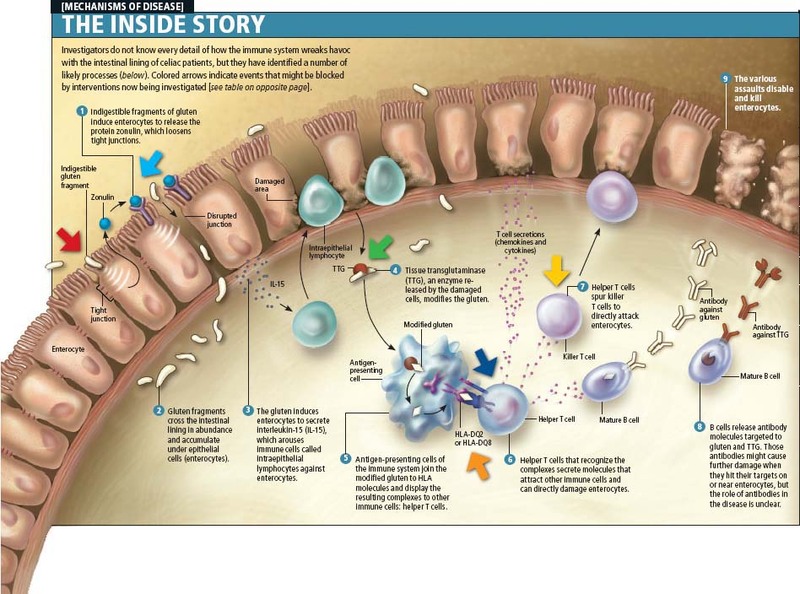 Summary: Leaky gut is based around a legitimate medical concept called intestinal permeability. It’s unknown if this permeability is a cause or symptom of disease. Genetics: Genetically susceptible individuals have an exaggerated immune response to foreign particles. This response is thought to activate several pathways involved in intestinal permeability. Lifestyle Triggers: Stress and diet over the long-term are key factors, too. 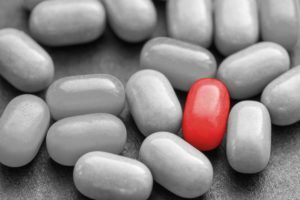 In particular, food intolerance, excessive alcohol consumption, certain toxic and nonsteroidal anti-inflammatory drugs (NSAIDS), certain antibiotics and radiation. We can see that the Western lifestyle is a major contributor to intestinal issues, which means it’s largely preventable. Summary: The main triggers of intestinal permeability (leaky gut) appear to be genetics and lifestyle. This includes stress and diet. More specifically, the underlying cause of leaky gut is complex and still poorly understood. Zonulin is a protein primarily responsible for the intestinal permeability mechanism. However, there is still a limited understanding of how it all works. Studies suggest it helps regulate the movement of fluid and particles between the bloodstream and intestine. It does so by controlling the tight junctions between the cells of the intestinal wall, which controls what materials get through. Zonulin opens tight junctions, increasing permeability. Click to enlarge. Source: Imd-berlin.de. Raised zonulin signalling increases permeability via tight junctions, allowing more particles into the blood. 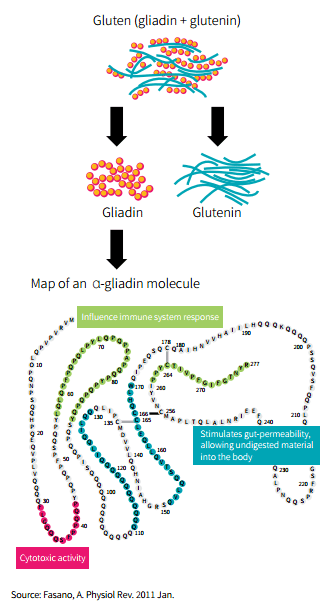 This is said to be what occurs when gliadin (component of gluten) is ingested by sensitive individuals and is linked to progression of celiac disease and other autoimmunity issues (2, 5). Research shows there are also some infectious agents and several inflammatory mediators involved in the regulation of tight junction size and function. In particular, TNF and IL-13 (1, 6, 7). This suggests zonulin may not be the only pathway to influence intestinal permeability. 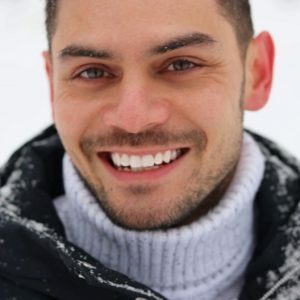 Additionally, early research suggests that an imbalance of our gut bacteria – known as gut dysbiosis – may also play a critical role in altering gut permeability (8). In fact, a “leaky gut” may facilitate communication between our gut bacteria and key signalling pathways of the brain. This would help explain why gut bacteria appears to influence stress-related psychiatric disorders, such as anxiety and depression (9). Summary: The underlying mechanisms of leaky gut are not well understood. Zonulin appears to be the primary factor, however there are other mediators that influence intestinal permeability. There are numerous symptoms thought to be caused by leaky gut, although they are strictly anecdotal (patient reported). These overlap strongly with one another and with numerous other health conditions, which is why the condition is not clear. Summary: Symptoms are quite vague and share many similarities with other conditions. Lactulose and mannitol are two indigestible sugars that show in our urine. Lactulose is large and can only cross the intestinal barrier through a “leaky” pathway or site of damage. For this reason it’s used to test barrier integrity. Mannitol, which is one-third as large as lactulose, can be thought of as a method of measuring surface area. However, physicians don’t typically use this test because it’s unreliable and doesn’t add much value. Even if the test is accurate, there’s no evidence that leaky gut causes disease, and therefore it only shows a symptom. It’s like a stool sample that shows blood; blood indicates there is an issue, but blood is not the cause. An enzyme-linked immunosorbent assay test (ELISA) is also available. This looks specifically at zonulin. Theoretically, the higher the level, the more intestinal permeability there is. But this is also unproven. In fact, one recent study found that higher levels of zonulin was more associated with an increased risk of obesity than gastrointestinal symptoms or diseases (10). Be wary of websites that provide mail-order lactulose-mannitol or serum zonulin tests to detect leaky gut. Neither should not be used as a tool to self-diagnose any condition. 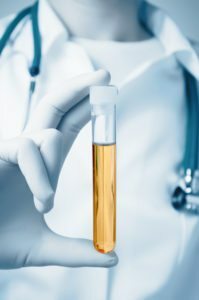 Summary: There is a leaky gut test called the lactulose-mannitol ratio test, as well as one that assesses serum zonulin levels. However, neither are entirely accurate and don’t provide any additional information that is useful. Observational studies provide clues as to what conditions and diseases may be influenced by leaky gut. Findings cannot prove “cause and effect” or whether increased intestinal permeability is a symptom or the cause. But they can be used to develop theories. Animal and human studies have repeatedly shown impaired intestinal permeability exists in type 1 diabetes (11, 12). Zonulin and gliadin are linked with its progression, but it does not seem to be the cause (13, 14). Celiac disease is triggered by the ingestion of gluten (or gliadin more specifically). Gliadin has been shown to increase zonulin concentrations, therefore increasing intestinal permeability. This drives the autoimmune response (15, 16, 17, 18). Human studies show once gluten is removed from the diet, zonulin levels decrease, and barrier function restores (19, 20). Crohn’s disease and ulcerative colitis are two inflammatory diseases of the gastrointestinal tract. Collectively they are known as inflammatory bowel disease (IBD). The cause of IBD is unknown, but it’s clear that increased intestinal permeability is heavily involved. A genetic trait is likely responsible for the increased permeability, especially during the early stages of IBD (21, 22, 23, 24). Without treatment, the condition is made worse by a variety of inflammatory compounds that further damage intestinal barrier function. Early evidence suggests approximately 40% of asthmatics have elevated zonulin levels and increased intestinal permeability (25). This may play a role in vulnerability to environmental triggers and allergens, but it’s only speculation. The fact that it’s only observed in 40% suggests it’s not the cause. Studies have shown that approximately 25% of MS patients also have intestinal permeability (26). Again, considering it’s the minority of patients, it’s much more likely to be a symptom than the cause. One study found that patients with autism and their families have abnormal levels of intestinal permeability compared to the healthy population (27). The results are interesting, but cannot prove cause and effect. Summary: Leaky gut is linked with numerous conditions, particularly IBD, celiac disease and type 1 diabetes. However, it’s unclear if it’s a symptom or a cause. Leaky gut proponents claim that restoring the intestinal barrier will cure the underlying disease. However, this is just an untested theory, and current research suggests it’s not the case. Human and rodent studies show that intestinal barrier loss is insufficient to initiate disease on its own. Additionally, anti-TNF agents that help restore barrier function have not been effective for treating conditions, such as celiac disease (1). Therefore, primary forms of treatment targeting a specific autoimmune disease should be followed first. This includes medications prescribed by your doctor and a dietitian-approved meal plan. Summary: Unfortunately, studies suggest that healing intestinal permeability does not cure the actual condition or disease. Given the non-specific nature of leaky gut syndrome, there is no one-size-fits-all diet approach. It depends on what condition you have (typically autoimmune specific), your age, risk of additional health problems, and your current nutrition status. For example, the diet for an individual with type 1 diabetes is completely different to that of Crohn’s disease. Although only a small percentage of people are gluten intolerant, chances are you’re one of them if you have an autoimmune disease. Given the link of gliadin and zonulin, as well as gluten and gut health, it can be useful to trial a gluten-free diet for one month or more. That means cutting out gluten-containing foods (such as bread and flour), which offer no unique nutrients you can’t get from other foods. Remember that “gluten-free” junk food is still junk food. Vegetables provide the bulk of fiber, vitamins and minerals in our diet. Aim to eat more cruciferous and leafy green vegetables every day. These provide the folate you miss if you are gluten-free (most bread is supplemented with folic acid). Starchy vegetables are also a great choice, as they provide fermentable carbohydrates that feed the healthy bacteria in your gut. Get in the habit of preparing or choosing meals with vegetables at both lunch and dinner. Foods and beverages high in added sugar should be consumed sparingly. Not only are they a key driver of obesity and metabolic disease, but they also influence and change the balance of our gut bacteria. This could also affect intestinal permeability, at least theoretically. Summary: There is no one specific diet to treat leaky gut. There are some general tips to follow, including removing gluten and eating more vegetables, but overall diet changes should be tailored to the individual and their specific condition. With leaky gut syndrome sold as the “root cause” of many diseases, a whole new marketplace has opened up for supplement manufacturers. There have been no clinical trials on supplements for intestinal permeability, except glutamine. Glutamine is currently the most popular leaky gut supplement. It’s an amino acid used as a fuel source by cells in the gut. However, the weight of evidence has failed to show benefits as a supplement in humans. Almost all studies use intravenous glutamine (injected) on hospitalized patients with Crohn’s disease. So its real-world application as an oral supplement is purely speculative (28). The latest human trial supplementing 0.5 grams per kg (ideal bodyweight) of oral glutamine per day found it only normalized intestinal permeability in 8 of 14 participants (57%), after 2 months (29). However, 8 of 14 participants in the control group – supplementing an equal amount of whey protein powder instead – also normalized intestinal permeability. This indicates that glutamine supplementation has no beneficial effects over whey protein powder, if it’s even beneficial at all. Probiotic supplements are a source of bacteria that we eat for health benefits. It’s suspected that bacteria in the gut can influence intestinal permeability, and early mice studies suggest probiotic supplementation can positively affect intestinal permeability (30, 31). But it’s not yet understood what strains are beneficial for humans, and at what dosages. Vitamin D is an often recommended supplement given its possible protective effect on intestinal permeability. While many studies have shown promising results, especially among those with IBD, the role of Vitamin D is still unclear (32). 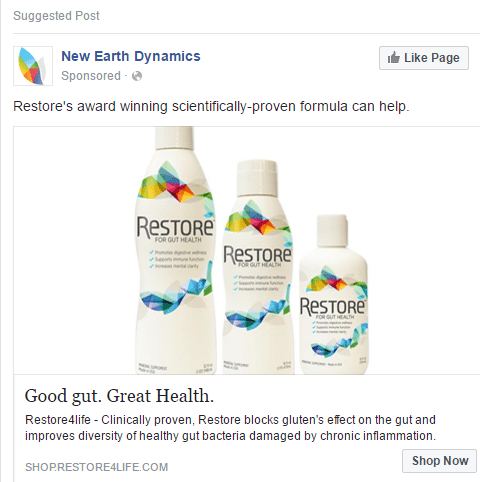 The latest leaky gut syndrome supplement being pushed on potential customers is called Restore. They claim the product is “scientifically-proven” and “clinically-proven” to block the impact of gluten and protect tight junctions. However, the three studies referenced on their website are not real. This makes their claims disingenuous and misleading. The first study is a grant application, which is a short proposal that outlines a possible study. So the study has not actually been conducted. The following two so-called studies are unpublished trials that do not specify how the study was conducted. There is no information on who conducted it, how many participants were involved or what dosage of Restore was used. This type of product will become increasingly common on the back of the leaky gut movement. Summary: There are no studies to show glutamine supplementation is beneficial for intestinal permeability, especially in humans. Supplements that claim to improve leaky gut are completely speculative, even if they claim to be clinically proven. Leaky gut syndrome is basically the non-medical (marketing) term for intestinal permeability. While a “leaky gut” has been associated with disease, there’s not enough evidence to claim it causes autoimmunity, especially on its own. Attempts to improve intestinal permeability have not resulted in an improvement of overall symptoms. Additionally, supplements claimed to heal or improve leaky gut – such as glutamine – do not hold up when studied in humans. 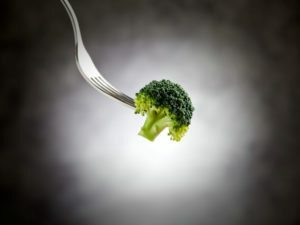 The most reliable and cost-effective way to protect your gut health is to eat a diet rich in both leafy and starchy vegetables, and strictly limit junk food. Gluten-free may also be beneficial if you have an autoimmune condition, at least theoretically. But that’s just too convenient.